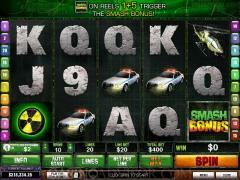 The Incredible Hulk is a Playtech online slot based on the movie The Incredible Hulk. It has been licensed through Marvel Movies. The introduction shows Bruce Banner being transformed into the Hulk. The symbols on the reels are all taken from The Incredible Hulk movie. There is the Green Liquid in a beaker that transforms Banner to the Hulk. There are Police Cars and Helicopters, which are the favorite smashing items of the Hulk. The high value card symbols are fashioned in thick stone, which is another item that the Hulk regularly smashes. The Hulk is the wild symbol. In The Incredible Hulk players can exercise all three betting options. The coin size varies from 0.01 to 5.00. The paylines can be varied from 1 to 20, but it is better to play with all paylines enabled. The number of coins can be varied from 1 to 10. However the number of coins is not displayed but the total line bet based on the number of coins and the coin size. The Incredible Hulk has three special symbols. The Hulk is the wild symbol. It appears only on reels 2, 3 and 4. When it appears on the central row of reel 3 it expands to occupy the entire reel. Then 2 re-spins are offered with the remaining reels spinning. When it appears anywhere on reel 2, reel 3 and reel 4 it expands to occupy all the three reels. Then 1 re-spin is offered with the remaining reels spinning. 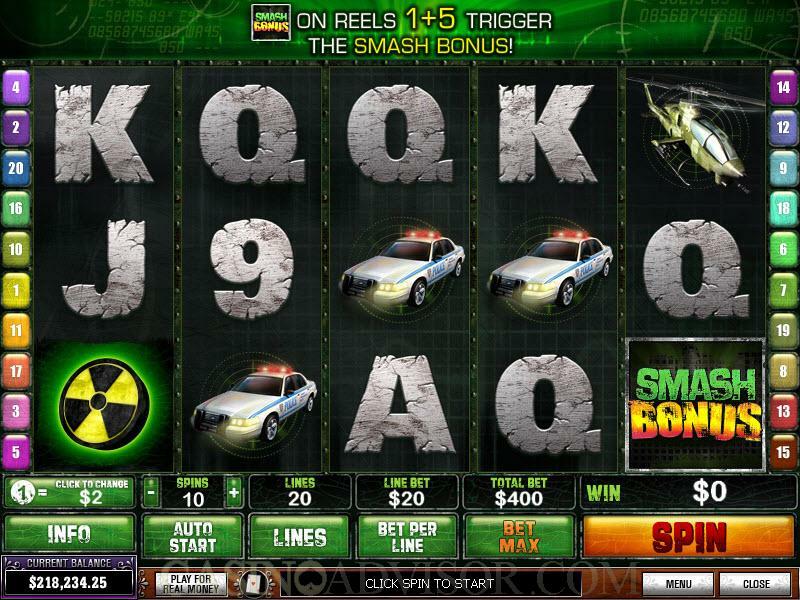 The Smash Bonus feature can be won during re-spins but not the free spins feature. The Incredible Hulk Logo is the scatter symbol. When three or more appear anywhere on the reels scatter payments are won. Also the player gets 10 free spins at tripled payouts. 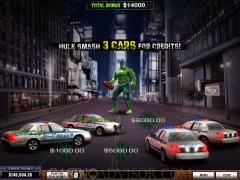 During the free spins the expanding Hulk appears more frequently to offer additional advantage. The free spins can be retriggered indefinitely, but the Smash Bonus feature cannot be activated in the free spins rounds. The third special symbol is the Smash Bonus Logo. When it appears simultaneously on reel 1 and reel 5 the Smash Bonus feature is activated. Fans of the Hulk movie will love this feature because it involves the Hulk’s favorite activity. First seven police cars appear on the screen and the player gets the Hulk to smash three of them to win bonus credits. The Hulk Rage feature can be randomly triggered and if this happens the Hulk smashes all seven cars for more credits. Then the Hulk has to smash one out of three helicopters to reveal the multiplier. Interested in reading more detailed information about The Incredible Hulk? If so Click Here for more details.